As boaters take to the waters this Fourth of July weekend, the US Coast Guard is reminding everyone to take all of the necessary safety precautions to avoid tragedy. Each Fourth of July weekend, dozens of vessels congregate in the waters of South Florida for views of fireworks displays. When the waters become more crowded with boaters, they naturally become more dangerous. According to USCG data, more boaters crashed in Florida than any other state last year. At 73 incidents, Miami-Dade County leads the state of Florida with the most crashes last year. 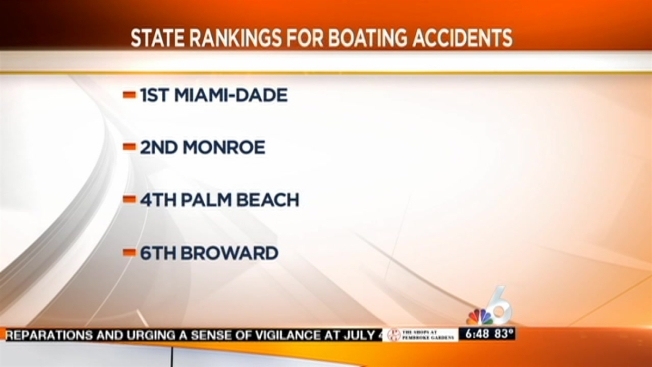 Not far behind are Monroe County at number two, Palm Beach County at number four, and Broward County at number six in terms of boat crashes in the state of Florida. Most notably, a violent boat crash just this past Fourth of July claimed the lives of four young adults. The group had just finished watching a fireworks display when they sped back toward Dinner Key Marina, crashing into another vessel. Coast Guard officials will be out in full force regulating boaters all weekend, along with state and local law enforcement and first response agencies. There will be a strictly enforced 15-knot speed limit in the Intercoastal Waterway, extending from Buena Vista to Black Point from 7 p.m. July 4 until 2 a.m. July 5.